We recently reviewed the XSPC RayStorm 750 RS360 which offers an entry point into a customised watercooling loop yet performs extremely well despite it's budget cost. To take the kit one step further we will today be looking at adding a couple of SLI blocks into the mix to improve cooling on two NVIDIA GTX680's. While XSPC do a wide range of waterblocks, it is typically the CPU and then GPU that see the most benefits from watercooling. This has never been more important thanks to throttling of graphics cards depending on GPU temperatures, particularly with NVIDIA's GPU Boost which has direct correlation between temperature and available 'boost' speed. Adding a waterblock to the GPU in your system is likely have a dramatic effect to GPU temperatures, especially considering that the GPU is commonly the hottest component in a PC and receives the biggest amount of work in a gaming PC, more so than the CPU as the GPU will often be under 100% load for many hours during a gaming session. It is therefore critical that the GPU receives efficient cooling and while air cooling will do the job, water simply does the job much better and if the right components ar chosen, quieter. 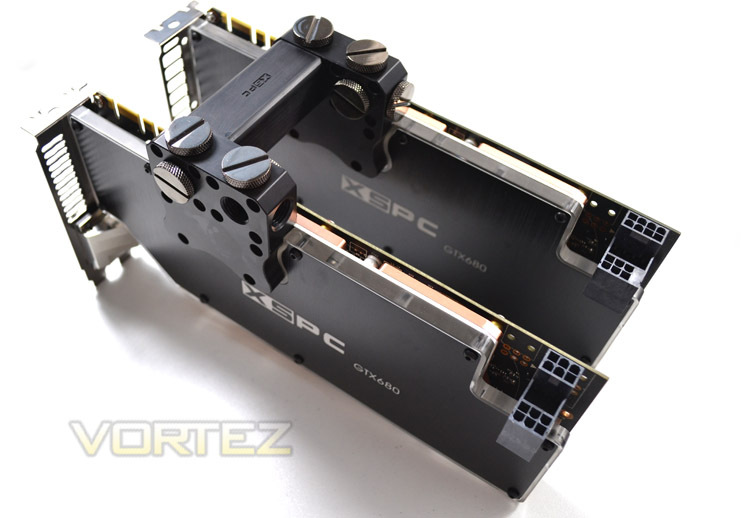 So then, today we will be taking a look at not one, but two of XSPC's new RAZOR GTX680 waterblocks in SLI and the accompanying Flow Bridges. Sleek, black, illuminated, with smatterings of copper, Acetel and perspex - it seems XSPC know exactly what the enthusiast wants. The new multiport connector gives you many choices for neatly routing your tubing. We have two G1/4&#8243; ports on the front and back of the block, two on the top, plus a side port, giving 7 ports in total. The multiport connector is compatible with our new SLI flow bridge.